Want to know how to engage your sponsors and increase their change management awareness? 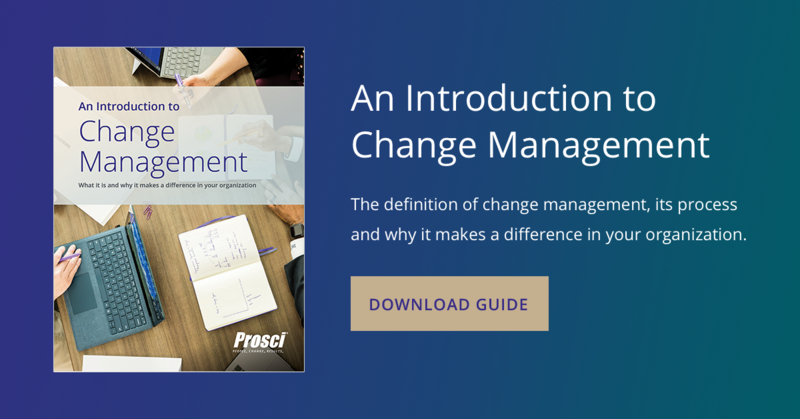 Below is a 10-minute overview of change management for executives, which provides the what, why and how of change management. Use this overview to help sponsors understand their role in change and become invested in making change management succeed. Why Is Change Management Necessary? Various studies have shown that the likelihood that projects meet or achieve their objectives is directly related to change management effectiveness. One study with 327 project leaders (the Business Process Reengineering Benchmarking report) indicated that failure to manage the people side of change, and the associated employee resistance, was the top obstacle to project success. The report cited employee resistance to change five times more frequently than any other project obstacle. Prosci’s correlation data from over 2,000 data points and nine years shows that initiatives with excellent change management are six times more likely to meet objectives than those with poor change management. 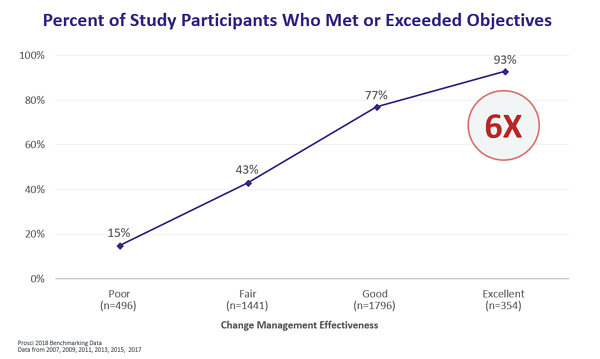 By simply moving from “poor” to “fair,” change management increases the likelihood of meeting objectives by threefold. When change management delivers targeted levels of adoption and usage, the probability of achieving business objectives, on time and on budget, increases. When the people side of change is poorly managed, projects fall behind schedule, fewer employees engage in the change, and proficiency levels are lower; projects deliver a lower ROI or in some cases fail completely. The primary sponsor is the individual who authorizes and funds the project. This person is usually in control of the resources, systems and people that are affected by the change. The primary sponsor usually has the authority to determine the scope of the change and its timing. Sponsor refers to any senior or mid-level manager with responsibility for employees or systems impacted by the change. In this context, a sponsor is defined as any business leader whose support and active engagement is necessary for the change to be successful. Sometimes the term "key stakeholder" is also used to refer to this role. Sponsorship refers to the activities expected by employees, and therefore required, of a good sponsor. These behaviors include active and visible participation throughout the project, building a coalition of sponsorship with peers and subordinates, and communicating directly to employees. The sponsor coalition is the collection of sponsors within the organization. The affected employees report to sponsors within the sponsor coalition. A strong sponsor coalition is a good indicator of project success, whereas a weak sponsor coalition is a good indicator that projects will fall behind schedule, miss objectives, or fail completely. Managers and supervisors with employees affected by the change play a key role in helping their employees through the transition process. These managers and supervisors are the preferred senders of change messages related to how a change personally impacts employees. All sponsors, managers, supervisors and employees affected by the change are stakeholders. In many changes, external partners, vendors and even customers may be considered stakeholders. They all have a stake in the outcome of the change. This role is assigned to the individual who has overall responsibility to implement the project. The project leader has direct day-to-day control over the project team, project management activities, and all resources associated with the project. This role is assigned to the individual who creates and implements change management plans for a project. Change management plans include communications, sponsorship, coaching, training and resistance management. Individual change management manages change at an individual level, with each employee. Organizational change management is used to enable successful individual change management. And when individuals successfully transition through the change, then the organization is able to achieve its objectives. Enterprise change management is the structured and intentional deployment of change management across and throughout an organization. Beyond change management effectively applied on individual projects, organizations with mature change capabilities create an infrastructure to make the management of change an organizational capability and a strategic, competitive advantage. Institutionalizing change management practices, processes, capabilities and competencies makes effectively managing the people side of change a core competency and cultural value of the organization. Building an intentional and repeatable strategy for change deployment enables an agile and change-ready organization. Gain the tools to successfully apply change management to a project and communicate the role of change management to others in your organization by attending the Prosci Change Management Certification Program. Scott comes to Prosci with more than 25 years of experience leading and managing change. 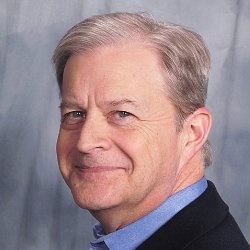 As a Prosci Master Instructor, Scott presents and teaches the Prosci methodology to large and small companies across a variety of markets and businesses.